Configuring InterVLAN Routing on a Layer 3 Switch and providing DHCP to multiple subnets Part 1 | Chinny Chukwudozie, Cloud Solutions. ← How to Restore an Active Directory Object from Backup. 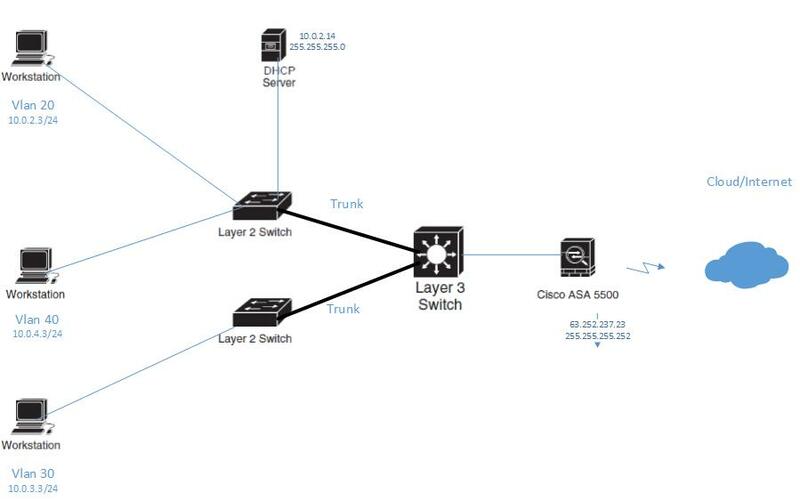 In this series, I would like to post my practical experience in setting up multiple VLANs/subnets and using a Layer 3 switch to route traffic across them. The post will also include my configuration steps enabling the use of a Microsoft-based DHCP Server. This is by no means a treatise on these subjects. A number of sites exist with more detailed and in-depth information of the subjects. In the next post, I will show how to create and configure the Switch Virtual Interfaces and configure the helper address on the 3750G. I will also post my configuration for the 2960 Access switches. This entry was posted in Cisco, DHCP, Helper Address, IP, Router, svi, Switch, Switch Virtual Interface, vlan and tagged 2960, 3750G, IP, SVI, VLAN. Bookmark the permalink.